Located about 40 miles northwest of Los Angeles is the “other” presidential library in Southern California. Having visited The Nixon Library in July, Tracy and I (along with friends Lenny and Susan) decided to drive out to Simi Valley on Labor Day to tour the Ronald Reagan Presidential Library. Of the 13 presidential libraries, the Reagan Library is the largest (space-wise, anyway). As is par for the course for Simi Valley in September is the fact it was going to be a hot day, so we had plucked the first reservation time (10:00 a.m.) by phone a few days earlier. Parking near the library in the lot (if you arrive an hour or two later, it is quite an uphill trek to the library from parking spaces along the road), the first thing we came upon was a picnic area adjacent to the museum. We’d just eaten, but it looked pretty. We were greeted at the door by a nine-foot tall statue of the 40th president of the United States, complete with cowboy hat. After getting our tickets, we walked past a picture of Reagan and visited an exhibit of his childhood days back in Dixon, Illinois. Then we moved on to displays of his political campaigns. And then there were some more exhibits of his days in the White House. The 1981 assassination attempt is well-documented with both photos and videos. It seems a staple of most presidential libraries is a replica of the Oval Office. 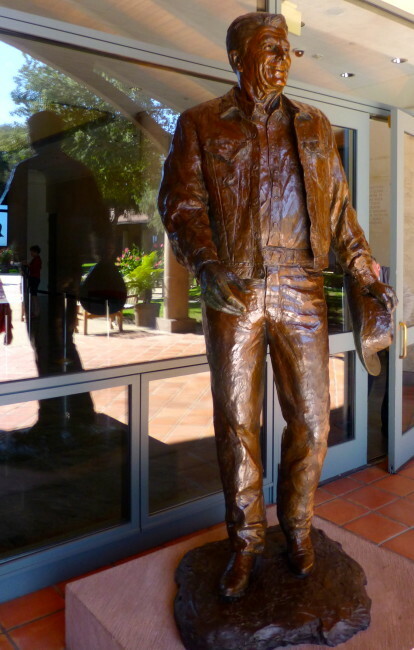 Reagan’s library is no different. If you wondered how Nancy dressed during those years, there’s an exhibition for you (not for me). The highlight of the library, in my opinion, is the Air Force One Pavilion. Located in that 9,000 square foot area is a Boeing 707 that Reagan and six other presidents used while president. The plane was disassembled and transported to the library in pieces in what was called Operation Homeward Bound. The plane was dedicated in 2005 by Nancy Reagan, George W. Bush and wife, Laura. Of course, you can go on board and have that obligatory photo taken, which we did. 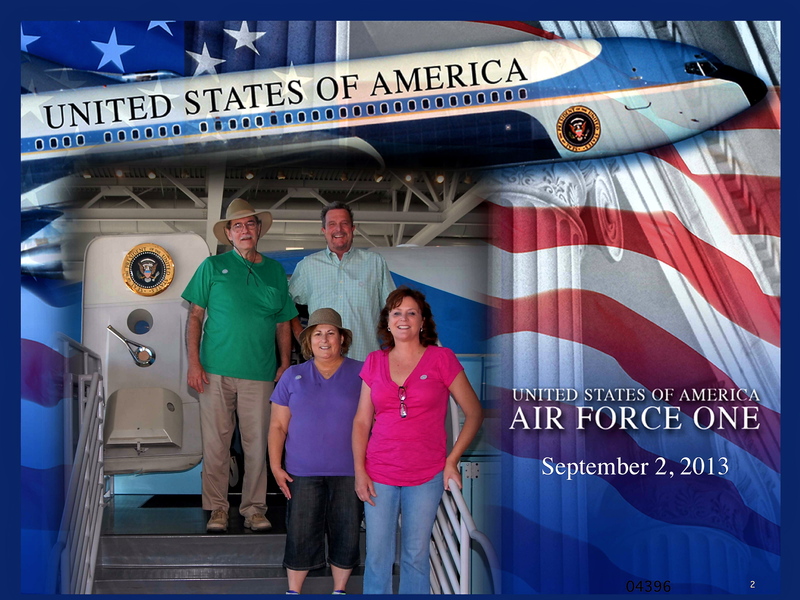 Plus it afforded me the opportunity to see how much Tracy and I had aged since February of 2009 when we visited the Reagan Library with Kim and Mary. She’s doing much better than me, and I swear I’m not wearing the same shirt…really! Also on display in the Air Force One Pavilion is a retired Marine One helicopter, which was utilized to take the President between various locations. I stayed out of the potential motorcade. We have enough traffic in L.A.
One of the levels of the pavilion is a wall dedicated to the Secret Service. Before we left the Air Force One Pavilion we took a gander at a replica of a pub that Reagan visited when he traveled to Ballyporeen, Ireland, in 2005. The pub was called O’Farrell’s, although the exact replica is now called The Ronald Reagan Pub (well, it is his library). …including a piece of the Berlin Wall (one of a few pieces located here. Next we visited an area that showed a video about the death of Reagan in 2004. including the flag that was given to Mrs. Reagan. 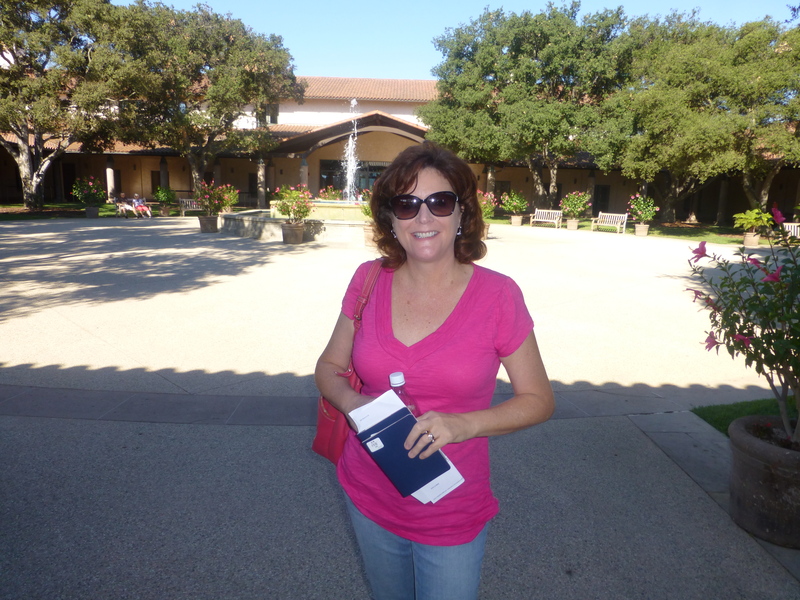 One of the reasons wed wanted to revisit the Reagan Library was to see a special Abraham Lincoln temporary exhibit. This was the most crowded part of the library that we visited, and displays included his stovepipe hat, the bloodied pillow from the night he died, and a Lincoln-signed Emancipation Proclamation and 13th Amendment. The exhibition also had a replica of the coffin Lincoln was placed in 1865. It was then time to say goodbye to Lincoln and head outside. One of the first things we saw as we stepped outside was another piece of the Berlin Wall (“Mr. Gorbachev, tear down that wall”). Finally we reached the area overlooking the countryside. This is where Reagan is interred. The area has a beautiful view…and there are numerous trees planted in the vicinity of his grave. 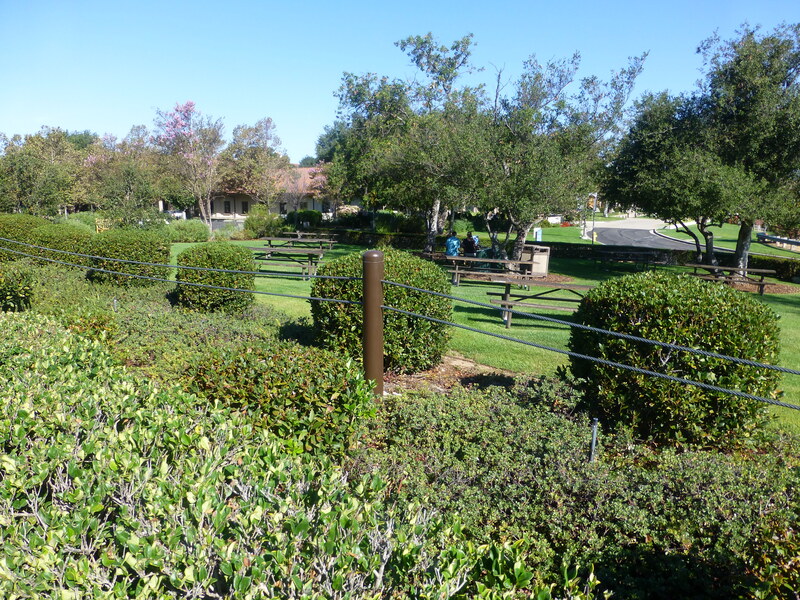 …and there are numerous trees planted in the vicinity of his grave. I hope to someday hit all the presidential museums (sort of like my mission quest, which needs to get back up to speed). This is definitely a worthwhile experience that will take a few hours out of your day, but to truly enjoy it, my best suggestion is to get here early. Audio/Video Tour Of The Museum: $7.